Toyota India showcased the 2018 Yaris C-Segment sedan at the Auto Expo, and the car will be launched here during April. 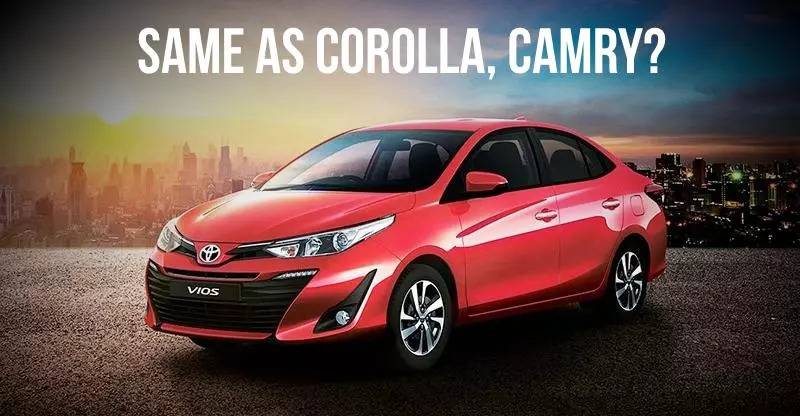 While the Yaris is a Honda City-Maruti Ciaz competitor, the vice-chairman of Toyota Kirloskar India, Vikram Kirloskar, has said that it’s technically the same as the much larger cars such as the Corolla/Camry. He said this in reference to the premium features the Yaris would pack-in. The car will be a segment leader in terms of premium-ness and this is perhaps why the vice-chairman made such a statement. We are very much in the premium car market, part of which is also the Yaris, which we launched. There is no technical difference between that and a Camry or a Corolla, no high-end features have been taken away. In terms of features on offer, the 2018 Yaris for the Indian market, will get a powered driver’s seat, factory tinted glass, roof mounted AC vents with ambient lighting, power sockets for rear passengers, cruise control, paddle shifters and rain sensing wipers. In so far as safety features go, it’ll be quite loaded, with features such as 7 airbags, ABS, EBD, electronic stability program, reverse parking sensors and camera, proximity sensors at the front, hill hold assist, and a tyre pressure monitoring system on offer. The car will be a petrol-only model though. It’ll use a 1.5 liter petrol engine equipped with variable valve timing, but whose specifications haven’t been revealed yet. A 5 speed manual gearbox and a CVT automatic gearbox with 7 stepped shifts will be offered with this engine. Toyota is expected to position the Yaris squarely in Honda City territory in terms of pricing. Design-wise, the car looks like a mini-Corolla Altis and that alone should give it a solid start in the Indian market.